After a barrage of leaks and rumours, the Samsung Galaxy A8s smartphone has been unveiled in China. The Galaxy A8s comes with the South Korean maker’s latest Infinity O display panel that accommodates selfie camera within the screen. 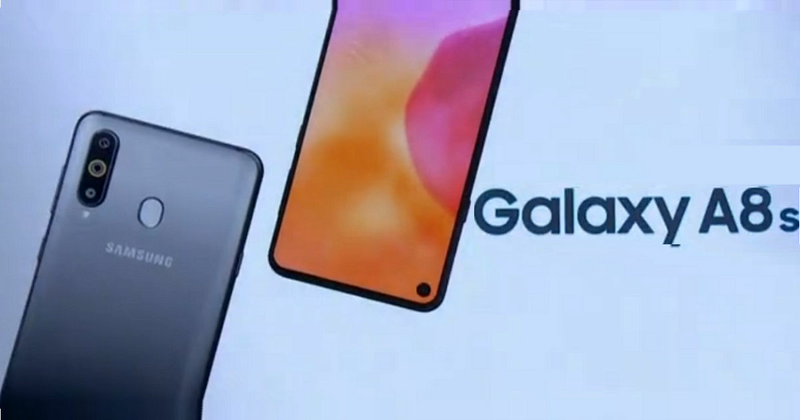 It has minimalistic bezels, an edge-to-edge display, and the front camera housed in a piercing at the top-left corner of the screen, marking a major beginning for Samsung in terms of display design. The handset also flaunts a high screen-to-body ratio, triple rear cameras, and an upper mid-range Qualcomm chipset. The Samsung Galaxy A8s price in China has not been revealed yet. However, potential buyers can register for the sale of the device till 11:59pm on December 20th via the official Samsung China e-store. Those who register to buy the device will get 20 percent discount on accessories as well as a chance to win a JBL CD-18 Bluetooth speaker. The handset comes in a glass-sandwich design with black, green, and grey colour options. Talking about the Samsung Galaxy A8s specifications, the handset sports a 6.39-inch Infinity O display with Full HD+ resolution (1,080 x 2,340p) and an aspect ratio of 19.5:9, which is highest ever for Samsung device. The Galaxy A8s is driven by 10nm Snapdragon 710 chipset clocked at 1.7GHz and paired with 6GB/ 8GB of RAM. The storage onboard is 128GB which can be further expandable by adding microSD card slot. On the camera front, the Galaxy A8s features a setup of 24-megapixel (f/1.7) + 5-megapixel (f/2.2) + 10-megapixel sensors on the rear aided by LED flash. The 10-megapixel sensor is a telephoto lens with 2X optical zoom. The handset’s selfie camera gets an impressive 24-megapixel shooter on the front. However, the remaining Galaxy A8s specifications have not been revealed officially by Samsung, so we will have to wait till it goes on sale for that. Nonetheless, the TENAA listing of the smartphone reveals it will boot Android 8.1 Oreo out of the box with Samsung’s custom skin applied on top. Other features include a 3,400mAh battery, a rear-mounted fingerprint sensor, and a dedicated key for Bixby AI assistant. In terms of connectivity, the Galaxy A8s offers 4G LTE, dual SIM, Wi-Fi, Bluetooth, and GPS. Lastly, as tipped by TENAA, the phone measures 158.4 × 74.9 × 7.4mm and weighs 173 grams.